During the opening week of operation at Canyon, Grant and Bridge Bay Campgrounds we only offer sites on a first come/first served basis. 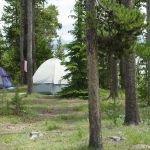 We do this because the early season dates at these specific campgrounds are frequently impacted by heavy snow and wet conditions. Without having to make reservations, guests can visit the campgrounds and decide if the conditions are suitable for their situation and desired experience. If so, they can stay. If not, there are no reservations to cancel or refund. We typically do not sell out during the first week of operation at each of these campgrounds. There are no electricity, water, or sewage hook ups at any of the campsites. Rates include two showers per night. Rates do not include taxes and utility fee. Rates and dates are subject to change. 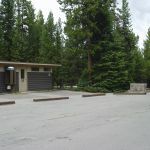 Interagency Access and Senior Pass discounts are applicable at this campground. Hiker/biker, per person $7.75. RVs up to 40 feet in length can be accommodated in certain sites. The sites may be back-in or pull through. As sites may not be level, campers and recreational vehicle users should plan accordingly. 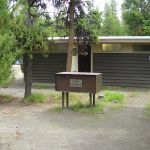 There are no utility hook-ups at this campground, although an RV dump station is available. The dump station may not be available early and late season due to freezing temperatures. 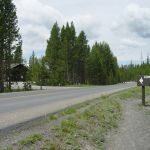 All campgrounds operated by Yellowstone National Park Lodges have restrooms with cold water and flush toilets. Coin-operated ice and soft drink machines, and recycling and refuse containers are located nearby. Individual campsites have one picnic table and one fire grate (except at Fishing Bridge RV Park-which has neither). 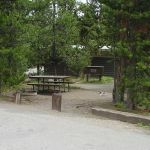 Group campsites have one picnic table and one fire grate for approximately every six people and are for tent camping only. Showers are not included in group campsite rates. Firewood is sold at all campgrounds except Fishing Bridge RV Park. Food storage regulations are strictly enforced at all campgrounds. Per NPS regulations, generators may not exceed 60 decibels. Sites that accommodate RVs at Canyon, Bridge Bay, Grant Village, and Madison campgrounds are either pull-through or back-in with limited width for slide-outs and MAY NOT BE LEVEL; please plan accordingly. Some sites are shaded while others are in open areas. 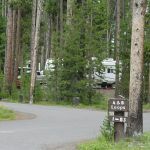 All sites at Fishing Bridge RV Park are back-in sites, located in an open area surrounded by a pine forest. 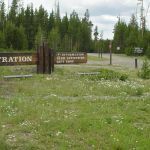 The Interagency Access and Senior Pass is applicable for discounted rates (50%) at all Yellowstone campgrounds except Fishing Bridge RV Park. 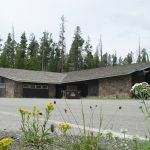 In the Grant Village itself, approximately a mile from the campground, there are many services available including a full service and casual dining restaurant; gas station with gas, diesel and propane; gift shop; post office and general store with groceries available. The National Park Service provides a Ranger station, visitor center and amphitheater offering exhibits and Ranger programs. Interdenominational church services provided by a Christian Ministry in the National Parks are offered on Sundays at the amphitheater. Please note that odors attract bears. The following items (new, clean, dirty, empty or full) may NOT be left outside, in tents, or in tent trailers at any time, day or night. Items listed below need to be stored in a hard sided vehicle or in shared food storage boxed located throughout our campgrounds when not in use. 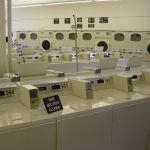 A violation of these rules may result in a citation and/or confiscation of these items. The bears’ future and the safety of others depend on you. Picnic meals, fast food, and deli lunches are available from our restaurants and snack shops. Please inquire at any Xanterra Parks & Resorts food service outlet. 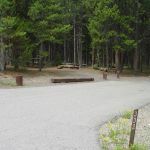 Yellowstone National Park features several picnic locations. View National Park Service picnic guidelines and locations for additional information.